FOMC will consider a rate hike on a "meeting-by-meeting basis," Fed chairwoman Janet Yellen tells the Senate Banking Committee. Federal Reserve Board Chairwoman Janet Yellen gave an upbeat message to lawmakers Tuesday: employment has been improving “along many dimensions,” domestic spending and production have been increasing, and real gross domestic product (GDP) is now estimated to have increased at a 3.75% annual rate during the second half of last year. However, in testimony before the Senate Banking Committee, Yellen noted that U.S. inflation continues to run below the FOMC’s 2% objective. “In large part, the recent softness in the all-items measure of inflation for personal consumption expenditures (PCE) reflects the drop in oil prices,” Yellen said. Yellen also said that the FOMC considers it “unlikely that economic conditions will warrant an increase in the target range for the federal funds rate for at least the next couple of FOMC meetings.” The Fed’s next policy meeting is March 17-18. The timing of normalization will depend critically on continued labor market improvement. 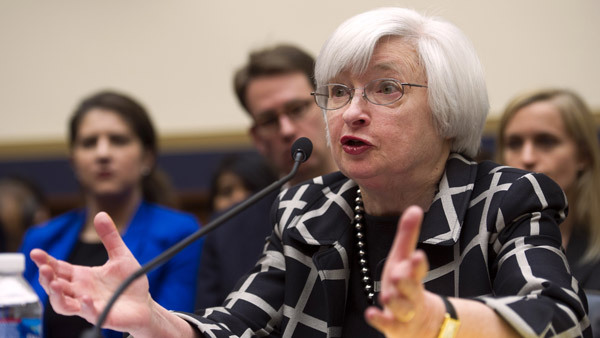 Foreign economic developments, however, “could pose risks to the outlook for U.S. economic growth,” Yellen said.